By combining data from NASA’s Chandra X-ray Observatory, the Giant Metrewave Radio Telescope (GMRT) in India, the NSF’s Karl G. Jansky Very Large Array, and other telescopes, researchers have found out what happens when matter ejected by a giant black hole is swept up in the merger of two enormous galaxy clusters. 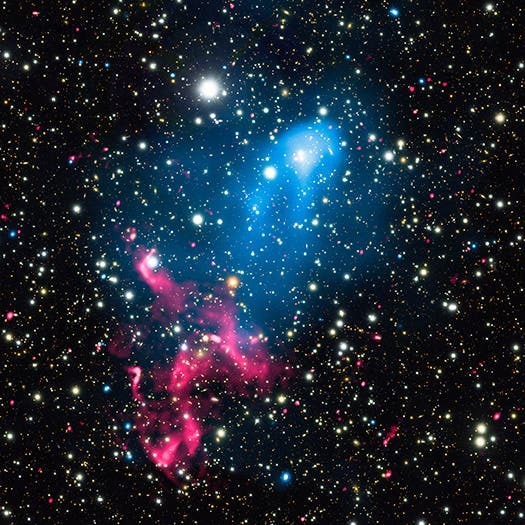 The comet-shaped appearance of the X-rays detected by Chandra is produced by hot gas from one cluster plowing through the hot gas of the other cluster. Optical data from the Keck Observatory and Japan’s Subaru telescope, both on Mauna Kea, Hawaii, detected the galaxies in each cluster. This discovery solves a long-standing mystery in galaxy cluster research about the origin of beautiful swirls of radio emission stretching for millions of light years, detected in Abell 3411 and Abell 3412 with the GMRT. The team determined that as the shock waves travel across the cluster for hundreds of millions of years, the doubly accelerated particles produce giant swirls of radio emission. These results were presented at the 229th meeting of the American Astronomical Society meeting in Grapevine, TX. NASA’s Marshall Space Flight Center in Huntsville, Alabama, manages the Chandra program for NASA’s Science Mission Directorate in Washington. The Smithsonian Astrophysical Observatory in Cambridge, Massachusetts, controls Chandra’s science and flight operations.